I grew up in New York, but Virginia was where I was born, and where I continue to visit my cousins, who reside in the Richmond area, once a year, so I know it well. 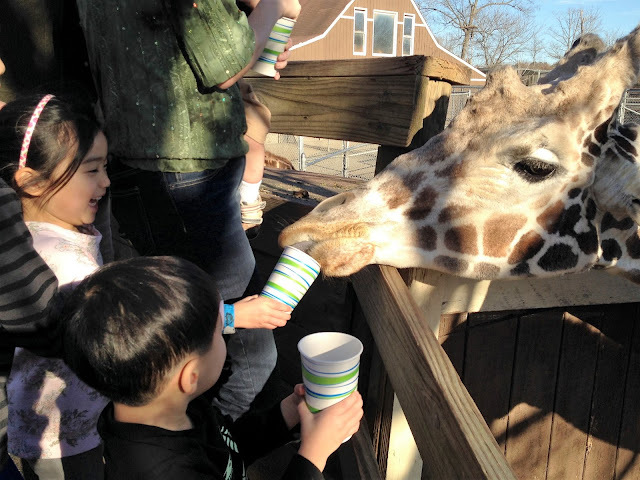 Here's my shortlist of favorite things to do with the kids whenever we're in Richmond. The Metro Richmond Zoo is one the smallish side, but in my opinion, that works in its favor. You can see just about all the animals up close, including at my favorite exhibit, the giraffes. Here you stand on a bridge overlooking their habitat and feed them food pellets as they sidle up to the bridge. We also love the skyride that goes over some of the other habitats, and the budgies exhibit, where parakeets land on your shoulder to snack on food sticks that you can purchase for a nominal fee. 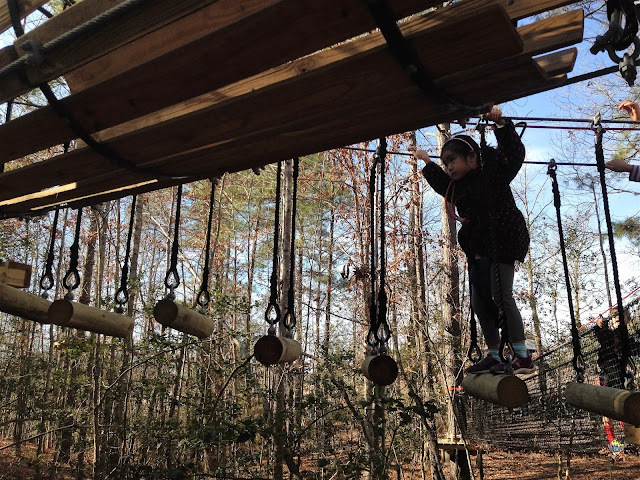 Right next door to the Metro Richmond Zoo is the Treetop Safari, which features two separate ropes courses, one for adults and one for kids ages 4 and up. My children had a blast climbing, balancing and scrambling through the junior course, set in the forest over a winding creek. There are even two short ziplines that they can do. On a recent trip, we visited the Lewis Ginter Botanical Garden, which I worried might be a bit boring for the kids, but ended up being an awesome experience for everyone. The gardens are vast and well-maintained, with grassy hills, babbling brooks, and hands-on art installations to explore. Ask for the scavenger hunt at the ticket booth, and be sure to allot some time for the children's garden, featuring everything from a splash pad to "flower beds" (pictured below) to a tree house. We also hung out at the butterfly conservatory for a while. We had only a couple of hours to spend at Lewis Ginter, but we could've easily made a day out of it. There's a lovely teahouse on the premises for lunch, too. When my kids were very young, I liked bringing them to the Children's Museum of Richmond (the Short Pump location). I'm not a big fan of children's museums in general because I find them to be chaotic and germy, but this one is just the right size, well organized and clean, with exhibits that kept the kids' attention for a long time. Watching movies can be an extra special experience in Richmond, home to the historical Byrd Theatre. The grand old theater has been playing movies, including a kids' film, every day of the year for the past 80 years! Or, if the evening is clear and the kids are still up, head over to nearby Goochland, where you can experience a drive-in movie at the Goochland Drive-In Theater. If your kids are as into American Ninja Warrior as mine are, they'll love the ninja warrior course at Boomerang Air Sports, complete with two warp walls. I've been to a few trampoline parks prior before, but this one takes the prize. In addition to the ninja course, there's a trampoline park, a ropes course, a zipline and a rollerblading rink. We spent only 1.5 hours there and could've stayed longer. We never really get the opportunity to dine out much around Richmond — my aunt always cooks up a storm when we visit! — but one place that we did check out was award-winning chef Peter Chang's Cafe. The Szechuan chef is opening restaurants all over Virginia and garnering positive reviews all around; his food did not disappoint during our visit. My favorite amusement park in the world is Busch Gardens in Williamsburg, about an hour and change from Richmond. It even beats Disney World in my book! 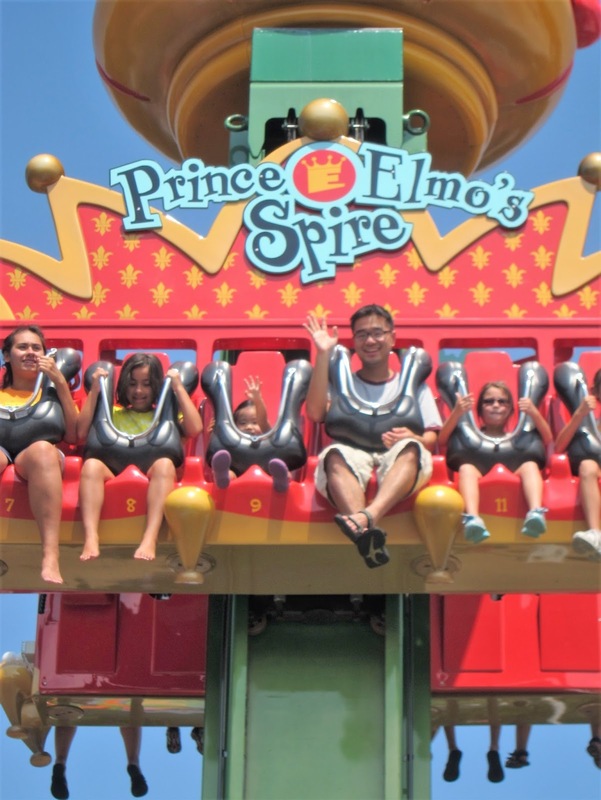 It's got rides for all ages (including a Sesame Street Forest for the youngest visitors), and the park is very invested in its European theming. We always have a pleasant time at Busch Gardens and love returning year after year. When the kids are older and have a better grasp on American history, we also plan on visiting nearby Colonial Williamsburg.